Quietly I’m having my morning coffee. I turn on my computer to write something on my journal and check my fellow bloggers. I’m taking the advantage of the house being quiet and my husband still sleeping after going to bed at 1am watching the series Stargate SG1. Silently, I’m sitting in my cozy chair, thinking what to do on this cold Saturday. I love being by myself before the commotion begins. I can think better with no rush. I’m planning to attend the flea market and check for great deals. Usually I look for antique cameras, lanterns, music boxes, and if I can get a few old books it would be a plus. P.D. Before I leave if someone is having any problem with the WordPress? I can’t like or make comment on other posts, no matter if I’m following the blog or not. It shows I’ve to login in when I’m already login and if I log again still doesn’t work. I don’t want anyone to think I’m not reading their post. What should I do? 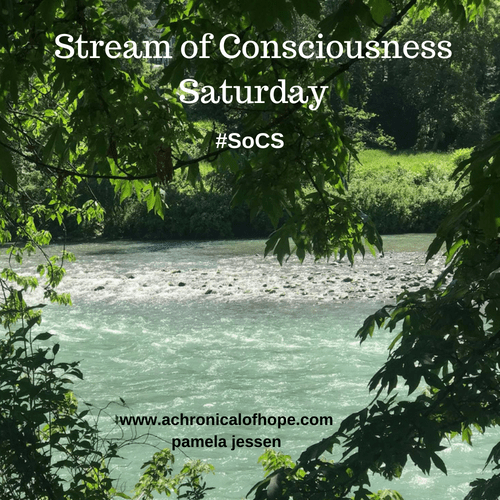 SoCS~ hosted by Linda G. Hill. This entry was posted in SoCS and tagged blogging, Linda G. Hill, SoCS, Stream of Consciousness, wordpress, writing prompt. Bookmark the permalink. Sorry I don’t know what the WP problem is. Have you tried the help thing? I know they sometimes will check to see what the problem is. I hope so, I don’t want anyone to think I don’t like or comments on their post. It will most likely get fixed, but if the problem persists, contact WP. I have the same problem at times myself. It is not every post even. I never know if what I wrote is going to go or not. Word Press is a real pain at times. Hi. I’ve found that logging out of WordPress and then logging off the phone or tablet (or whatever) and then rebooting it helps a number of problems. thank you, I will try to do that.